Mantica is the name given to the planet where Kings of War is set. All the factions, magic items, special characters and units belong to that world. As a WHFB player when i first made the move over to KOW i didn't pay much heed to the setting as i was still trying to cling to the Warhammer World pre End Times. Now, many months on, i have decided to take a good look at the lore of my new favorite Wargame. Mantica is a typical Fantasy setting and in that way it shares many similarities with the Warhammer World. Recognizable races like Elves, Humans, Dwarves and Orcs, a big bad going by the name of the Abyss, all of this is solid, traditional Fantasy. Like many Fantasy settings the draw comes not from the factions but from how those factions are used in creating a interesting backdrop for the game. A final note before i go on, from this point onward i will be writing as bard or scholar in Mantica as i feel that the story is best told in that style. 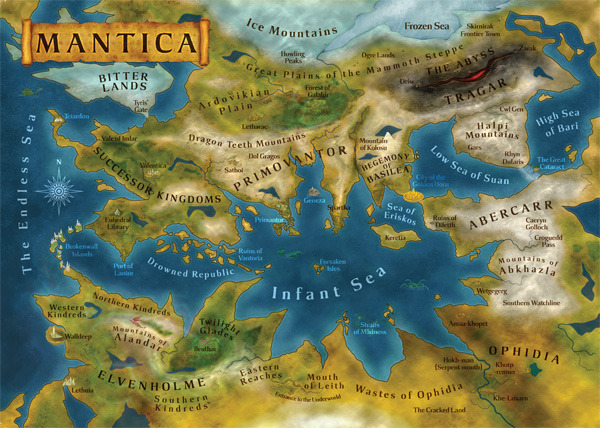 The story of Mantica starts with three golden age civilizations, Elves, Dwarves and Men, at the height of their power. These three races,known to us as "The Noble Peoples" worshiped a race called the Celestians, or Children of the Stars. The Noble Peoples saw these Celestians as gods and it is easy to see why as the Celestians bestowed gifts to each of the The Noble Peoples, gifts that fit the talents of each race. This golden age saw each of the three races excel at what they did best, Dwarves built huge underground cities, Elves crafted great works of art and Humans explored, even unto other planes of existence. While they were worshiped as gods during their time none truly know if the Celestians were gods or just a race more powerful and wise than the Noble Peoples themselves. Alas the answer to this question now may be beyond us as so many details of those mythical beings are lost to time, and what came next. All things must end and the Golden Age was no different but who among the Noble Peoples would have dreamed that it would be ended by the Elves, or more specifically the greatest among their kind? That Elf's name was Calisor Fenulian, the greatest wizard this realm has seen. It was said that his mastery of arcane lore would not be matched until the coming of Valandor the Great himself, that he could step between one plane and the next as easily as a man might walk from one room to the other, and that it was He who was the first to learn the magical speech of the Dragons, forging the strong bonds between the Elf and Draconic races . For all his might and wisdom Calisor was still vulnerable traps and follies of love, make no mistake love can be wonderful thing but it can also drive people to make great mistakes, and Calisor's love born mistake would be the greatest and most terrible of all. It started with his love for a human woman of the Primovantor, the mighty human kingdom of old, named Elinathora. Calisor first saw Elinathora when her father, Marcon, was made a envoy to the Elf city Therennia Adar and moved there with his family. Calisor quickly fell in love with Elinathora and began courting her, which was not uncommon seeing as the two races enjoyed peaceful relations. However Elinathora rejected his every attempt to court her, her reason being that she didn't wish to live in his shadow and die long before he did. After a great many failed attempts, and failed attempts of his friends who tried to convince her to accept, Calisor's spirit was crushed and he took to wandering the scared glades around Therennia Adar in search of solace. It was while he was walking these woods that he met a young Celestian named Oskan who offered to help him. Oskan gave Calisor way to build a mirror that would show past and future. Oskan told him that all he needed to do was build this mirror and get Elinathora to gaze into it and show would fall in love with him "Just as surly as the moon pulls the tides" . Before leaving him Oskan warned Calisor not to allow Elinathora to view past when the golden bird sings. It was unfortunate that the Celestian didn't attempt to ensure that his warning was hammered home or even properly understood, if he had done so then all that was to come may have been prevented. The tale that is Calisor's forging of the mirror would fill a thousand volumes for he strove long and hard to bring about this items creation, the trails he underwent to achieve this aim were numerous and trying. But it was his obtaining of the Star of Heaven, the very item that gave the Celestians their power that would have the most profound consequences. So ends part one of The Mantica Story. Nice story, Nobel was the guy who invented the peace prize, Noble is the high class as in of Noble birth. Nothing a quick search and replace won't fix. I don't own the hardback rulebook so I'm completely Mantica illiterate and really enjoyed this. Part two please!